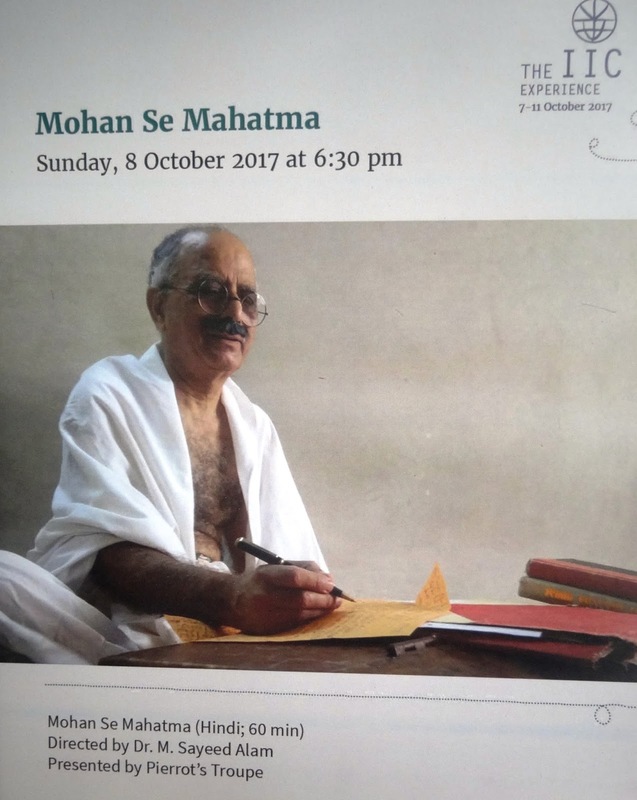 I watched the play 'Mohan se Mahatama' at the India International Centre, New Delhi on 9th October. It was in Hindustani and was presented by Pierrot's Group. It has been directed by Dr. M. Sayeed Alam. At the outset the compere reminded allabout the sad passing away of Tom Alter a few days back. The situation was all the more poignant as Tom Alter had played thepart of Gandhiji as Sutradhar in this play staged in July this year. The audience stood in a two minute silence to pay hamage to the late Tom Alter. 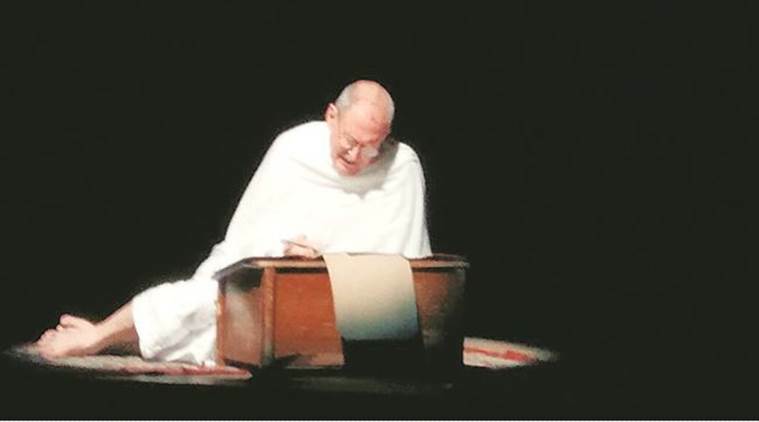 Photo of late Tom Alter playing the role of Gandhiji in a staging of this play earlier on 15th July. 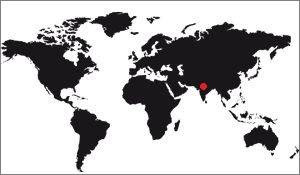 Photo source: The Indian Express. Actor who excellently played the same role in the staging on 9th October. The opening scene showing three women draped in white, belonging to three different age groups, taking out lice from each others hairs and talking loudly surely gains immediate attention of the audience. 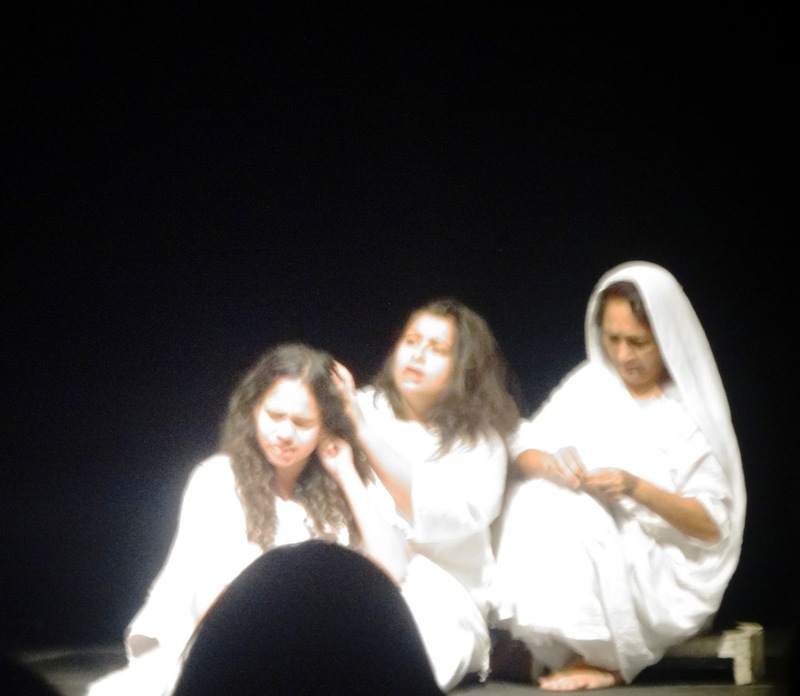 I felt small watching the play as I knew almost nothing about the Champaran Satyagraha of Gandhiji before this. The audience was all attention. However I did feel a little uncomfortable with two things- both relating to the scenes of young Gandhiji in Champaran. Firstly I found the very fine actor playing the role of young Gandhiji to be too stout, tall and well built. Secondly the scenes and the delivery of dialogues gave the impression of some arrogance rather than of sheer humility which was the well known trait of the Mahatma. And the choice of actors to play the role of the English officers too could have been better. This play is definitely worth a visit to know more about Gandhiji and Indian freedom movement.